Hey everyone - a short one from me today. A great many wildlife photographers online keep talking about doing something unique and thinking out of the box, and while there's nothing wrong with aiming for that (I often do too), it almost starts coming across as if shooting a classic shot according to sound photographic principles, with great technical settings and great use of light isn't a good thing anymore. Yes, some photos have been done by many others before. Yes, it's good to be unique. But realistically, with SO many people these days having access to digital photography equipment and posting their work online for everyone to see...how much truly unique work is really being done? That's not to say you should be discouraged from aiming for that, I'm just saying that sometimes you need to do whatever feels right in the moment (photographically speaking). Sometimes, shooting a classic shot that countless others have taken should be okay and should be satisfying to you. I know it is for me - heck, very little of what I do seems unique to me anyway, so I try not to get hung up on whether I'm really shooting groundbreaking shots all the time. 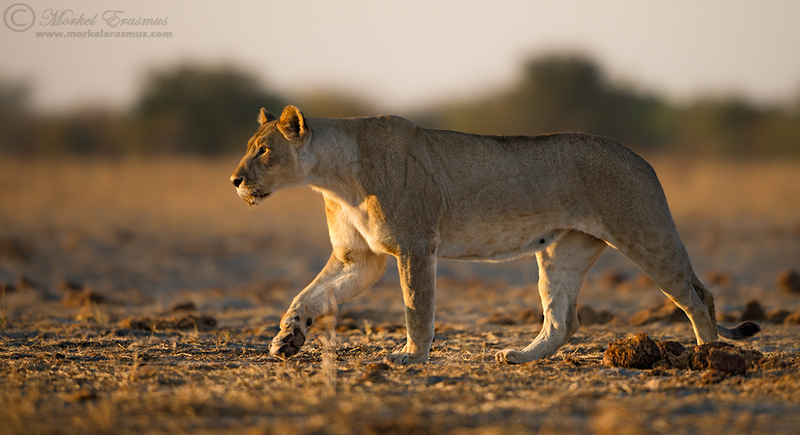 This lioness was photographed at a remote research waterhole in Etosha, Namibia. It was first light, and I was actually able to crouch on the ground next to our supply trailer and sleeping structure to photograph her as she strode past into the rising sun to my left. A thrilling experience (I had an exit route though - always be safe)! Good light, good subject, good angle. Nothing groundbreaking, but a pleasing image to me as a wildlife photographer. Until next time - keep the shutter whirring! It's a beautiful image, Morkel. I love this kind of classic photographs. Hi Gabor - thanks for dropping by and for your comment. Glad you like it!